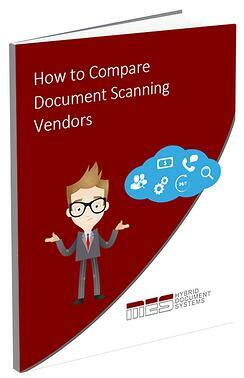 Looking to find the best document scanning vendor? Attempting to find a document scanning vendor that understands the complexities of your business can be difficult. It's important that not only is the business you choose at the forefront of their industry, but can work alongside you to keep your information safe and secure. To find out more about how to compare document scanning vendors and how to choose the best business to partner with, fill out the form to the right and download your free copy of our eBook today. By downloading our eBook you are consenting to receive email communication from MES Hybrid Document Systems regarding our services and other educational information we offer. You may unsubscribe at anytime.